AMD has really come a long way. There was a time when bad drivers plagued lineups of AMD, but now, for quite a long time, any claim of green having superior drivers (in terms of bugs and defects) are mostly founded on superstition. 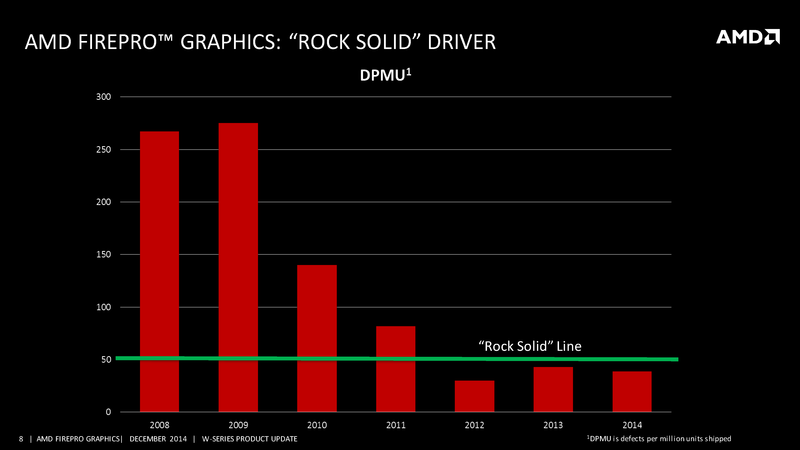 To demonstrate just how far AMD has come with its drivers (on the professional side) they have released the following statistic on DPMU numbers. 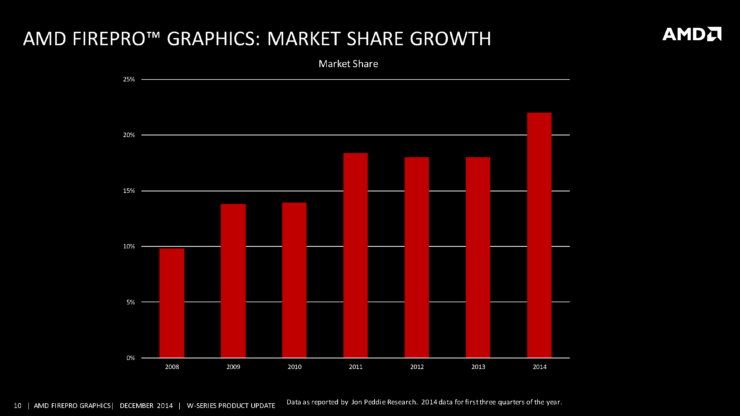 This particular slide was included in the press update deck and reveals just how far AMD has come in this short while. They were able to reduce their DPMU (defects per million units) number by an astounding 90% in just 3 years and are now well below the ‘rock solid’ standard of 50 DPMUs. This update was targeted at the professional side only so it doesn’t include Radeons, which would have made a perfect set coupled with this. AMD has also gained a market share of approximately 5% from Nvidia according to Jon Peddie Research. This is following the launch of their new generation of FirePro GPUs and also the fact that they have made a name for themselves in efficiency (No1 in Green500). 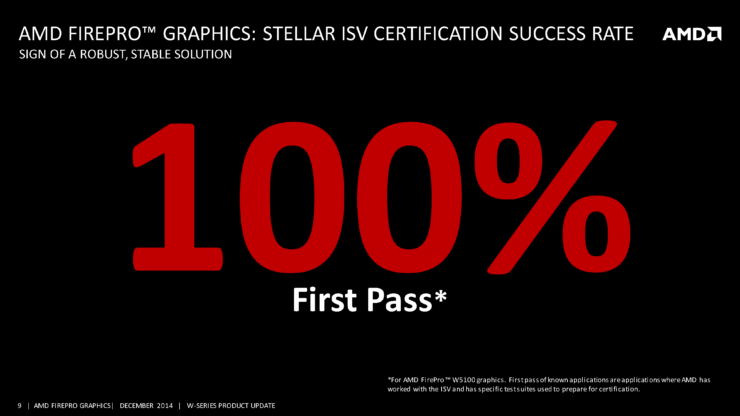 AMD FirePro W5100 graphics also has a perfect ISV certification success rate, and by perfect I mean the whole 100%. 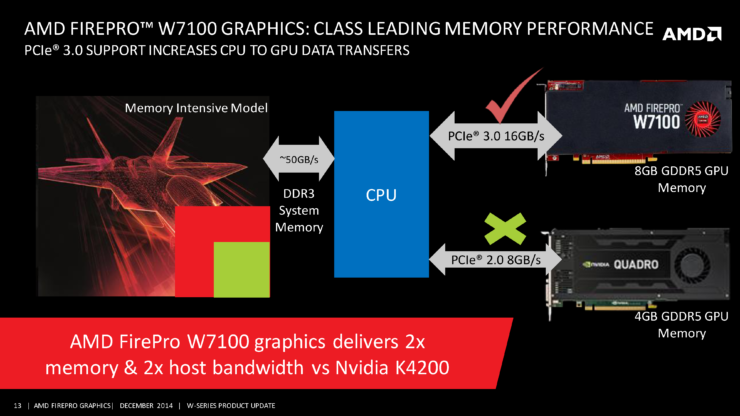 Finally they mention the advantages that FirePro counterparts entail, including higher vRam on average and the use of PCIe 3.0 (as opposed to PCIe 2.0 on some Quadros). The only difference that now remains between AMD and Nvidia pro GPUs is the fact that while AMD can only offer OpenCL implementations, Nvidia offers both CUDA and OpenCL implementations where the former is a closed but well developed ecosystem. Ofcourse, consumer drivers are usually a wee bit less polished than pro drivers. This is not because of lack of efforts but because the applications on the consumer sector are generally too vast to accurately cater for. Even then, in my experience AMD has come a long way when it comes to drivers. Maybe there was a time, when this claim held weightage, but I don’t think that is true anymore.